Many, afraid of torture, complied. However, St Terence and forty other Christians bravely affirmed their faith in the Savior and ridiculed the idols. Fortunianus was amazed at their boldness and he asked how they as rational people, could confess as God, One Whom the Jews crucified as a malefactor. St Terence answered that their belief was in the Savior, Who voluntarily endured death on the Cross and rose on the third day. Fortunianus saw that Terence inspired the others by his example, and so he ordered him to be isolated in prison with his three closest companions: Africanus, Maximus, and Pompeius. 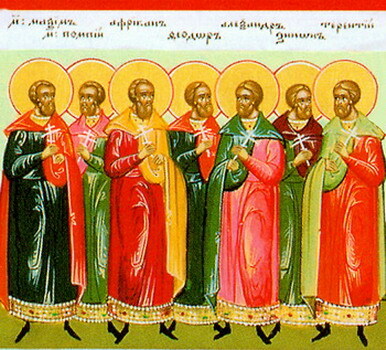 Fortunianus was determined to force the rest of the martyrs, including Zeno, Alexander and Theodore, to renounce Christ. 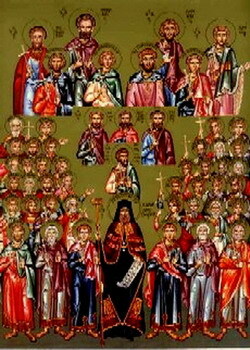 Forunatian gave orders to lead the martyrs into the pagan temple, and once again he urged them to offer sacrifice to the idols. The valiant warriors of Christ cried out, "O Almighty God, Who once sent down fire on Sodom for its iniquity, destroy this impious temple of idolatry." The idols fell down with a crash, and then the temple lay in ruins. The enraged governor gave orders to execute them, and the martyrs, glorifying God, bowed their necks beneath the executioner's sword. After the execution of the thirty-six martyrs, Fortunianus summoned Terence, Maximus, Africanus and Pompeius before him. He showed them the martyrs' bodies and again urged them to offer sacrifice to the idols. The martyrs refused. The governor put heavy chains on them, and gave orders to starve them to death. By night, an angel of the Lord removed the martyrs' chains and fed them. A chosen army of athletes from Africa contested nobly for the faith. and of one accord in their struggles. Now they intercede that we all may be saved. and draw near to receive healing. they heal the sicknesses of our souls.